If you have always dreamed of waters that are truly teeming with fish, join us for one of our magnificent trips to the shrimp boats out in the Gulf! After the night’s catch, shrimp boat crews clean their nets in the early mornings and throw the by-catch back into the sea, which attracts amazing amounts of fish. Thousands of pounds of by-catch are thrown into the water, attracting black fin tuna, kingfish, permit, cobia, and many other species who stay around the boat at all times, waiting for their treats. 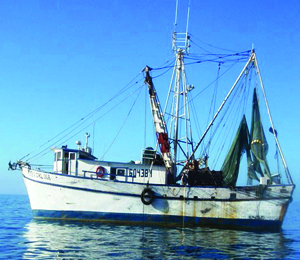 Shrimp boats make finding the fish easy and fishing in their vicinity is a fabulous experience! Trust our captains and crews to take you out to the shrimp boats for a one-of-a-kind fishing adventure! Our Gulf Shrimp Boat Specialty Tour leaves for the Gulf in the early morning hours, heading out to the shrimp boats anchored in the Gulf after a long night of catching shrimp. After some bartering, we score some fresh chum in exchange for beer or cigarettes and get to use a line off the shrimp boat stern for our day of fishing. While the shrimp boat crew gets some well-earned rest, we get ready for the ultimate Gulf fishing thrill. You will not believe the action around the shrimp boats! Fish bite by the seconds and you will catch more fish than you could ever dream of! This experience takes fishing to a whole new level! Nobody leaves this tour without a catch and everyone will want to go back for more. Make sure you schedule some rest time after this tour. You will need it! Your Gulf Shrimp Boats Charter is just a click away. Feel free to look at all the captains listed below in order to pick the perfect charter. I have been to the Bahamas many times, but Gulf Shrimp Boats is one of my favorite trips! It includes everything that everyone should do here. As a Bahamas veteran, I can say only the best about this experience!